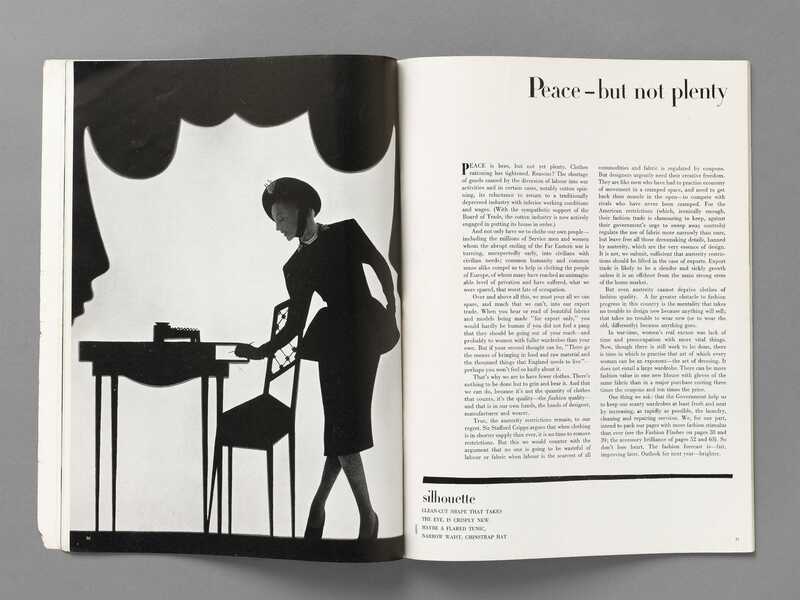 This double-page spread from the Vogue Peace and Reconstruction issue (See ‘Related Items’) shows on the left a striking image by fashion photographer Constantin Joffé, who as a staff photographer provided the magazine with much high-quality work during the 1940s. It is a pastiche of the silhouettes, particularly popular in the 1770s and 1780s, of ladies seated at small elegant tables, playing cards, taking tea, or arranging flowers. The Vogue lady, however, works with pen, notebook and typewriter at her table, suggesting the changed role of women in the work place and society. Her elegant suit, with its emphasis upon rounded hips, foreshadows Christian Dior’s New Look of 1947. On the right-hand page, the article ‘Peace- but not plenty’ explained the reasons for the continuation of rationing beyond the end of the war. Returning troops and the dispossessed of occupied Europe needed to be clothed, and the export trade encouraged in order to bring money into the country. At the same time the article argued for the importance of creativity and quality of design within these restrictions. 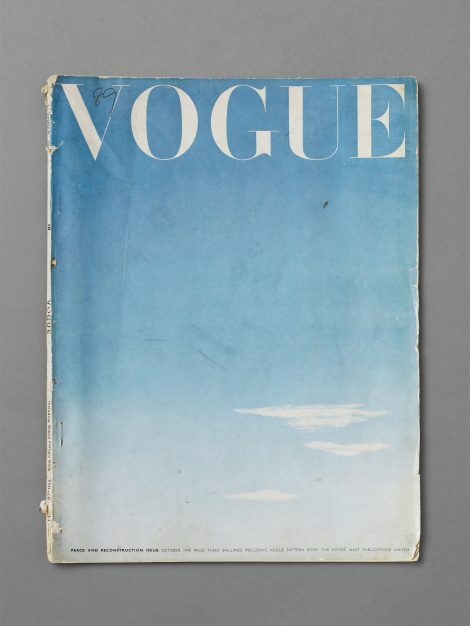 Vogue’s engagement with the serious social concerns of post-war reconstruction is evident from other articles in this issue. Author and politician Harold Nicolson discussed the Minister of Health, Aneurin Bevan’s plans for the National Health Service; eminent architect Frederick Gibberd wrote on the planning and designing of new housing and neighbourhoods, and novelist Rummer Godden focused on the future welfare of children. 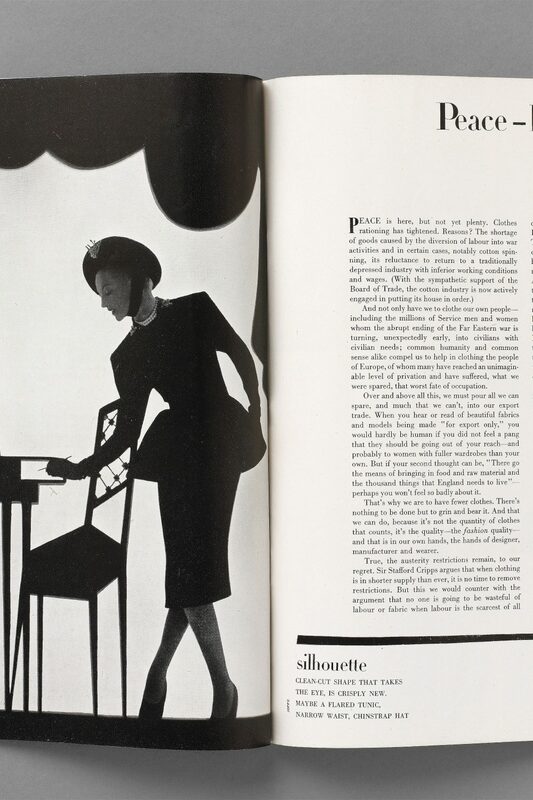 Side by side, fashion features included ‘important little dresses’, ‘silhouette hats’ and ‘shoes on the horizon’.